Same idea, just a bit cuter look! Jeans and a North Face- the Seattle uniform! to wear jeans, flats and a jacket for warmth and comfort. I tried two different looks- on the right I’m wearing straight leg jeans and my North Face jacket. Being a Seattle gal, I love my North Face as much as anyone- but it’s just not that fashionable! On the left I swapped out my regular jeans for a pair of dark skinnys and replaced my North Face with a cute cropped trench. I added a long necklace and another arm party (I’m liking this trend more than I thought!). It’s a much cuter look while accomplishing the same goal- comfort and warmth! I love it! 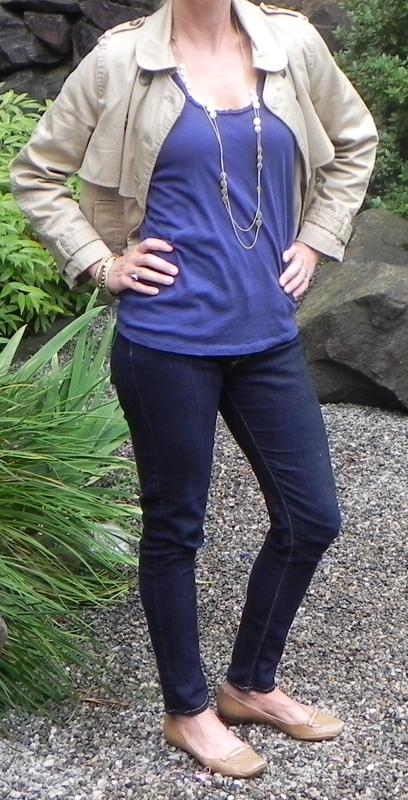 Cropped trench from H&M in University Village, skinny jeans from Anthropologie. Arm party again! Bracelets from Target. Layering the tank underneath means if the sun comes out (wishful thinking?) I can remove the jacket. I love this look, casual but cool. I know what you mean, I have a love/hate relationship with my North Face! It’s sooo comfy and warm, but not as stylish as I’d like! You did a great job, you look FAB in your trench and dark wash skinny jeans!! I hear you! It’s definitely a great coat, but when we want to look cute and stay warm- the trench is a perfect substitute!